Although the Veteran’s Bureau was created by Congress in 1921, Abraham Lincoln’s speech in which he called upon Congress “to care for him who shall have borne the battle and for his widow, and his orphan,” has lived on in the mission and motto of the U.S. Department of Veteran Affairs. Today, the U.S. Department of Veteran Affairs operates the largest, most technologically advanced integrated health care system in the nation. While a role in health care sounds rewarding at every level, there’s a notable difference to patient-driven care provided to service members and their families. Working directly with this group of patients can provide a rewarding and fulfilling career, knowing you’re actively making a difference in the lives who have fought for our country’s freedom. Choosing assignments or work at a VA clinic or hospital is no accident or coincidence. When you choose work in a private practice or hospital, you often gain many co-workers who have varying missions and goals. Some might be in it simply because this was their job or some might be working for the sake of money. While there’s no doubt about working for the patients, when you work specifically with veterans, service members, and their families, you’ll be working alongside health care professionals who share the same mission and goal – to serve those who have served. The opportunity to serve patients who have worldly experience as veterans and service members provides professionals filling these health care positions at Veteran’s Affairs clinics and hospitals throughout the country with the ability to learn about these stories and experiences. Sometimes, it’s equated to having patients who are also teachers! They may have stories to tell and life lessons to share, which can often make time spent working at a VA clinic fulfilling. 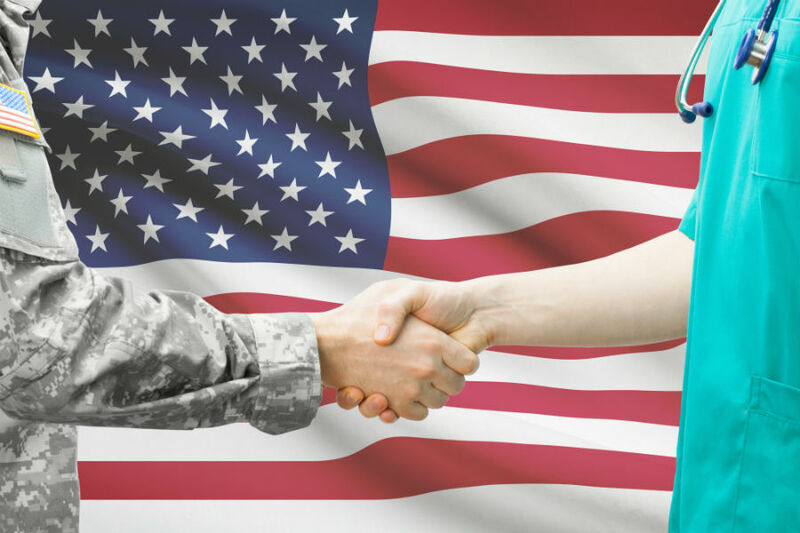 Not to mention, working with service members provides the unique ability to participate in studies of conditions most common in veterans and service members that healthcare professionals may not find often in patients of the general public. Since the Department of Veteran’s Affairs is the largest integrated health care system in the U.S., there are vast opportunities to work with service members and veterans. With more than 1,400 locations including 153 medical centers, 909 ambulatory and community-based outpatient clinics, 135 nursing homes, 232 Veterans Centers, 47 readjustment counseling centers and 108 comprehensive home-care programs across the nation, there are many opportunities for assignments in different locations. While these may only comprise some of the benefits to working with veterans, service members and their families, there’s no doubt that your next assignment should be working at one of the clinics or hospitals around the country. Just In Time staffing, we focus on the placement of nurses, allied health, technicians and medical administrative personnel on contract assignments nationwide. The partnerships we establish allow us to provide candidates with various opportunities throughout the country in a variety of settings. Ready for your next assignment? Contact us today to find your next career opportunity in the medical and healthcare industry.